In this collection of sermons, Dr Steven J Lawson speaks into our cultural moment, helping Christians and skeptics alike to answer Pilate's age-old question. 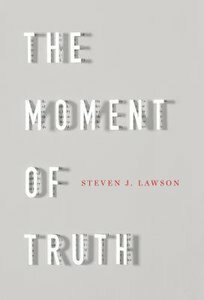 About "The Moment of Truth"
Dr. Steven J. Lawson is President and founder of OnePassion Ministries, which is designed to equip biblical expositors to bring about a new reformation in the church. Dr. Lawson hosts The Institute for Expository Preaching in cities around the world. He is also a Teaching Fellow for Ligonier Ministries, where he serves on its board. Moreover, he is Professor of Preaching and oversees the Doctor of Ministry program at The Master's Seminary, where he also serves on the board. Further, Dr. Lawson serves as the Executive Editor for Expositor Magazine published by OnePassion Ministries. Dr. Lawson has served as a pastor for over three decades in Arkansas and Alabama. Most recently, he was senior pastor of Christ Fellowship Baptist Church in Mobile, Alabama. He is a graduate of Texas Tech University (BBA), Dallas Theological Seminary (ThM), and Reformed Theological Seminary (DMin). Dr. Lawson is the author of twenty four books, including The Passionate Preaching of Martyn Lloyd-Jones, The Daring Mission of William Tyndale, The Kind of Preaching God Blesses, The Heroic Boldness of Martin Luther, The Gospel Focus of Charles Spurgeon, Foundations of Grace, Pillars of Grace, Famine in the Land, 'Psalms' volumes 1 and 2 and 'Job' in the Holman Old Testament Commentary Series. He is the series editor for The Long Line of Godly Men series with Reformation Trust. Dr. Lawson's preaching ministry takes him around the world, Likewise, he speaks at conferences throughout the United States, including Shepherds' Conference and Ligonier Ministries National and Regional Conferences.